Questions? Please contact marketing@dyntek.com or call us at 877-297-3723. Microsoft Azure opens a world of possibilities – spinning up virtual machines in minutes; providing scalable and durable cloud storage, backup and recovery solutions for any data, big and small; creating single sign-on to any cloud app and enforcing multi-factor authentication – just to name a few. So, where do you begin? With DynTek’s Azure QuickStart programs you can step up to the cloud through validated, easy-to-provision managed service offerings that incorporate the most popular workloads to move to the cloud. 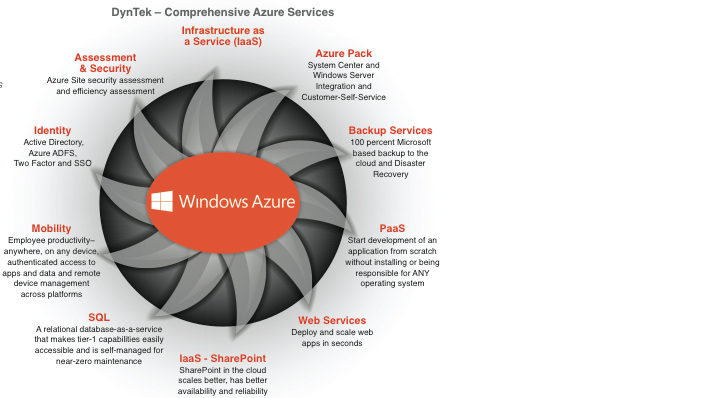 DynTek will help your organization manage and support both on and off premise infrastructure and applications with the cost-effective agility afforded by Azure.